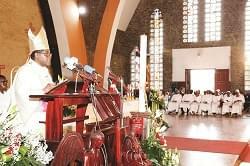 They were commissioned in Yaounde on Friday, September 16, 2016. 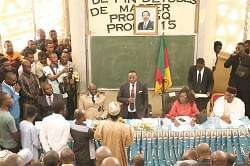 The courtyard of the Ministry of Arts and Culture in Yaounde was the venue of the commission of recently appointed officials of the Ministry of Arts and Culture on Friday, September 16, 2016. Friends, relatives and well wishers thronged the venue with bouquets of flowers to congratulate the new officials. Those commissioned were heads of attached services, sub-directors and chiefs of service. Speaking at the occasion, the Secretary General in the Ministry of Arts and Culture, Mouhtar Ousmane Mey, called on them to be efficient and duty-conscious in the exercise of their duties. He reminded them of the task ahead, which is to be fully committed in the implementation of the road map of the ministry as instructed by the Prime Minister, Head of Government. Mouhtar Ousmane Mey called on the officials to be disciplined, devoted, punctual and respect seniors in order to meet set objectives. He called on them to be creative and innovative so that culture will be a veritable lever for growth and employment. The Secretary General equally assured them of the support of the ministry to provide better working conditions as they carry their tasks so as to improve their performance. Mouhtar Ousmane Mey also used the occasion to hail former officials for loyal services rendered to the nation in particular and the Ministry of Arts and Culture in particular.